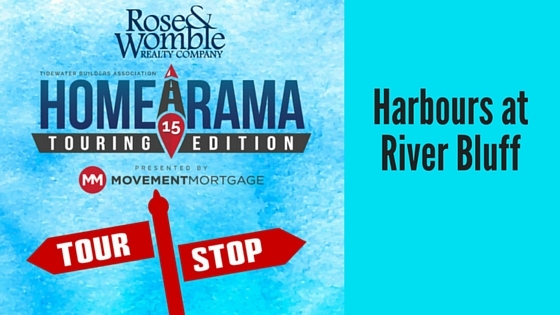 Located on the banks of the Nansemond River, the Harbours at River Bluff is happy to be included in the 2015 Tidewater Builders Association’s Homearama Touring Edition. The Kiawah model has five bedrooms and four baths, and with deep water access it is an incredible home for the boat lover. The Harbours at River Bluff are built by Platnium Homes. The community has magnificent estate lots up to 3 acres, many overlooking expansive tidal marshes and offer all the privacy anyone could want. The waterfront lots at The Harbours all front the deep waters of the Nansemond River, all offer private dock space for even large yachts, and all sit on a high bluff, capturing the natural beauty with sweeping vistas of the Nansemond.